MANILA, Philippines—A proposed diesel power plant project on Camiguin Island drew criticism from former senator Heherson T. Alvarez, a member of the Climate Change Commission. Alvarez, in a statement, said the project was in “direct violation” of an Energy Regulatory Commission (ERC) order. “This project is being rushed by the Camiguin Electric Cooperative (Camelco) in violation of due process, in the face of widespread community opposition, against the direct order of ERC, and against the best economic and environmental interests of the province and its people,” Alvarez said. In 2010, Camelco applied with the ERC for a loan to construct a 10-megawatt diesel power plant to replace electric power provided by a submarine cable from Cebu. “However, the ERC rejected Camelco’s proposal as not feasible in terms of cost and system reliability and instead approved the construction of a 13.2kv submarine cable to address Camelco’s increasing demand,” Alvarez said. Alvarez stressed that the diesel project lacked not only an environmental impact study (EIS) as required by law but also the necessary Environmental Clearance Certificate (ECC) from the Department of Environment and Natural Resources. The official said Camiguin was a proclaimed Environmentally Critical Area (ECA), being a major eco-tourism destination. Alvarez said that if there is a future need for more power, Camiguin should be encouraged and supported in developing its large potential in renewable energy. “In the long run, the diesel project will cause far more pains than benefits for Camiguin’s economy and society since diesel is expensive and its fluctuating market price is not good for the stability of the local economy, which is largely agriculture,” Alvarez said. He emphasized that carbon emissions will reduce air and water quality, creating a negative impact on the island’s ecosystems and biodiversity. Carbon emissions and warming waters will gradually kill coral reefs and other marine sanctuaries, thereby undermining the tourism potential and eco-tourism development of this island province, Alvarez said. Customers of Manila Electric Co. (Meralco) should brace for higher electricity bills starting this month up to July this year, as the expected increase in power consumption during the hot summer months puts pressure on power rates. The generation charge for the April supply month (which will be reflected in the May billing month) is projected to go up to P7.69 per kilowatt-hour, Lawrence S. Fernandez, Meralco assistant vice president and head of utility economics, confirmed on Friday. This represents an increase of P2.48 per kWh compared with the P5.21 per kWh gencharge recorded during the February supply month (which was reflected in the March billing month). The generation charge for the May supply month (to be billed in June) is projected to reach P6.57 per kWh, and for June supply month (to be billed in July), P7.23 per kWh, Fernandez said. Meralco has yet to announce the final generation charge for the March supply month (to be reflected in this month’s electricity bill). Indications, however, point to an expected increase in power bills as the higher demand for electricity will put pressure on prices at the wholesale electricity spot market (WESM), he explained. Fernandez, however, said that these projected generation charges could still go down should the Energy Regulatory Commission (ERC) approve Meralco’s application for three interim power supply agreements. The country’s biggest distribution utility recently signed power supply agreements that could provide up to 204 megawatts in additional capacity, in a bid to reduce and mitigate Meralco’s exposure to the WESM from April 1 to June 30 this year. According to Meralco, it signed separate interim agreements with Toledo Power Co. for the supply of up to 28 MW, with an option for an additional 9 MW, and with Panay Power Corp., which will provide 27 MW. A similar agreement was executed with 1590 Energy Corp. for the purchase of up to 140 MW in capacity and associated energy output from the 225-MW Bauang Power Plant in La Union. ERC Executive Director Francis Saturnino Juan said that the exposure of Meralco to WESM may increase to more than 10 percent of its electricity requirements without the additional capacity coming from the new supply agreements. It can be recalled that Meralco took a hit when it wanted to impose a P4.15 per kWh rate increase in the generation charge, given the high spot market charges of up to P36.08 per kWh for the billing month of December. The amount was later recalculated as the WESM prices during the said period were deemed unreasonable, irrational and uncompetitive. According to Fernandez, the approval of Meralco’s three interim power supply agreements will help bring down the generation charge to P7.16 per kWh for the April supply month; P6.23 per kWh for the May supply month; and P6.64 per kWh for June. These figures, however, were still higher than the P5.21 per kWh gencharge billed in March. In a related development, Meralco announced that it has filed in the ERC an application for new distribution, supply and metering charges. As provided under the Performance Based Regulation scheme, this application was for the adjustment of Meralco’s maximum average price for regulatory year 2015, and its rate translation into distribution, supply and metering charges to different customer classes. Manila Electric Co. (Meralco) on Wednesday said it would refund any excess amount should an order from the Energy Regulatory Commission (ERC) to recalculate electricity spot market prices cut the generation cost and other pass-on charges that it had collected from its 5.3 million customers. But William S. Pamintuan, Meralco first vice president, said the utility firm would charge customers an additional amount if the recalculation resulted in an amount higher than the P5.67 per kilowatt-hour that was collected in December and January. “We assure our customers that the computation on the recalculation of the generation charge will be transparent,” said Meralco spokesperson Joe R. Zaldarriaga. The ERC announced on Tuesday that it had issued an order voiding spot market prices, which drove up generation charges and related taxes in December and January, because these were not reasonable, rational and competitive. Militant lawmakers on Wednesday said the ERC had failed to recommend the proper penalties against those who had played a part in jacking up electricity prices. The ERC ruling covers spot market prices in Luzon, which means distributors except Meralco may immediately refund customers. Meralco is facing a temporary restraining order (TRO) on its December billing. The high spot market prices came in the wake of the simultaneous shutdowns of power plants while the Malampaya gas plant, which provides cheaper natural gas to Meralco suppliers, was shuttered for maintenance from Nov. 11 to Dec. 10, 2013. Lawmakers and the Department of Energy have accused power producers of collusion in the simultaneous shutdowns that jacked up electricity prices. The ERC order of March 3 effectively canceled its approval last December of a staggered P4.15 per kWh rate increase in generation charge that Meralco had sought to pass on to customers. In the order, the regulator directed Philippine Electricity Market Corp. (PEMC), operator of the Wholesale Electricity Spot Market (WESM), to recompute spot prices from November to December 2013. Based on ERC’s own simulation, the WESM prices for the period may drop by “more than half.” The final pricing, however, will depend on PEMC’s recalculated rate, according to ERC Executive Director Francis Saturnino Juan. By ordering a recalculation of spot market rates, ERC officials admitted their failure to do their job, lawmakers said. “They agreed to the P4.15 per kWh, and now they’re saying this should be recalculated. Are they then admitting they made a mistake?” Sen. Ralph Recto said in an interview. ACT Teachers Rep. Antonio Tinio said the ERC should be filing charges for violation of the Electric Power Industry Reform Act (Epira). At a press briefing, Tinio said the violation could be an abuse of market power, which has the prescribed penalty of imprisonment and fines ranging from P10,000 to P10 million. If the ERC commissioners cannot do their job, they should resign, he added. In a statement, Bayan Muna Rep. Neri Colmenares branded the ERC ruling as a damage control tool to mitigate public outrage against neglect of its duty. But Colmenares also said the decision was not enough. “The ERC decision will still reward Meralco and the generation companies with rate increases and higher profits when they should be punished and penalized for violating laws,” he said. Meralco had sought to pass on the P4.15 per kWh increase in the generation cost last December but the Supreme Court issued a TRO on the rate increase. Without the court order, the increase would have resulted in a generation charge of P9.107 per kWh in December. The generation charge goes to Meralco’s power suppliers. For January, the generation charges and related taxes were capped at P5.67 per kWh even without the TRO instead of the actual P10.23 per kWh. Meralco said this was in deference to the TRO on the December rates. Of the P4.15 per kWh rate increase last December that was deferred, generation charges accounted for P3.44 per kWh and the rest were from taxes and related charges. In turn, out of the P3.44 per kWh, the WESM accounted for P2.42 per kWh and P1.03 per kWh was from fuel cost of natural gas-fed plants. In January, of the generation charge increase of P4.56 per kWh, the P3.60 per kWh was attributed to spot market prices. The rest came from the cost of bilateral contracts and the fuel costs of three plants supplied by the Malampaya gas platform (which went on maintenance shutdown) that had to use more expensive alternative fuel. The state-imposed recalculation of spot prices means the WESM component of the generation cost and related charges will also go down, ERC said. The WESM prices last year seemed to be “unjustified” and “not competitive,” Juan said, considering the many plant outages and “underoffers” of power capacity during the supply period. The ERC also ordered PEMC to issue a new billing to Meralco seven days from March 11. E-trikes, or tricycles that run on saved electricity, are meant to help address pollution. The Department of Budget and Management said the government would spend a total of P4.27 billion for the e-trike project as counterpart funding. The project, estimated to cost a total of P21.67 billion, will be funded largely by the Asian Development Bank. Of the government’s counterpart funding, P506 million has been released, the DBM said. The ADB piloted the project over a year ago with the purchase of a few units of e-trikes. The goal of the project is to have 200,000 units of e-trikes in Metro Manila and 3.5 million across the country by 2017 to replace the ones that run on conventional fuel. Under the project’s framework, e-trikes will be offered to tricycle drivers on a lease or lease-to-own terms. The amount to be saved from doing away with fuel may be used by the drivers to pay for the e-trikes, the ADB said in a report on the project. “Now that the Aquino administration has released the government’s fund counterpart for the e-Trike project, we can expect to see more of these e-Trikes plying the routes taken by traditional tricycles, so that the electronic vehicles can take commuters to various drop-off points within their communities,” DBM Secretary Florencio Abad said in a statement. The cost of the project covers not only the purchase of e-trikes but also cost of hiring project consultants and conduct of surveys of local government units that will participate in the e-trike project. “Using innovative technology and competitive financing, this project will achieve widespread adoption of electric tricycles and the development of a sustainable local e-trike manufacturing industry,” the ADB said in the project report. The ADB said the e-trike project was expected to help temper the increase in oil importation and address pollution concerns. “This initiative will increase the environment’s carrying capacity to support the country’s sustained economic growth,” the ADB said. A new concept uses solar power to directly charge a plug-in hybrid’s battery pack. Solar power has proven itself better for static charging than it has for on-vehicle use, even if Australia’s Solar Challenge race has shown solar cars to be possible under certain, very specific conditions. There are other possibilities though, one of which Ford is exploring with the C-Max Solar Energi concept–which uses solar power to directly charge the plug-in hybrid’s battery pack. If you’re hoping this could be the car to finally make on-the-go charging a reality, you’ll be disappointed–it’s still designed to charge when parked up. But the concept is a unique one. Rather than plugging in your C-Max Energi each time you stop, you park below a special solar concentrator with Fresnel circular lenses. 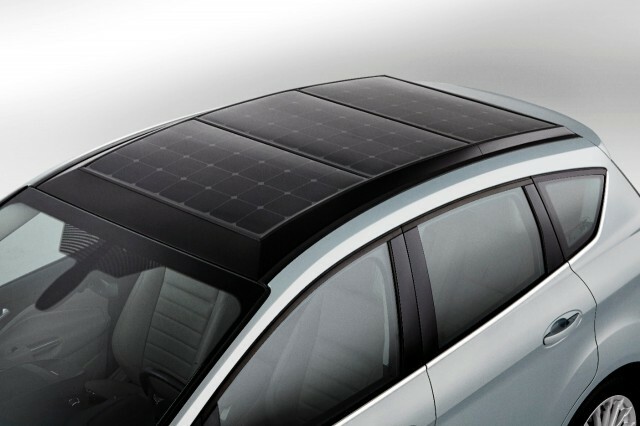 This magnifies the sun’s rays onto the roof of the car–which is covered by solar panels. The normal sunlight is boosted by a factor of eight–allowing the relatively small roof-mounted solar array, using SunPower cells, to gather enough light during a day’s charging for a full battery top-up, or 21 miles of EPA-rated electric range. It frees the car entirely from the need to charge via the electricity grid, though the Solar Energi retains its charge port so once you get home you can still plug it in and benefit from your home’s solar panels. If you don’t already have solar panels and charge via the grid, using the solar roof system could cut your grid charging by as much as 75 percent. A vital component in making best use of the sun’s energy is ensuring that the solar concentrator focuses as much light as possible onto the panels as the sun moves across the sky. In order to do this, the car is programmed to move autonomously beneath the collector, ensuring it remains below the focus of the light. Such a system doesn’t seem entirely problem-free. For a start, you’re replacing the complexity of an infrastructure-based solar array and charging system with a low-tech infrastructure, high-tech automobile complexity. Requiring the car to move within its (presumably fairly large) parking space seems like undue complication. Then there’s the spaces themselves, which need to be large enough to occupy a car moving along their length. And you still need to erect these solar collectors above relevant spaces, which isn’t entirely infrastructure-free. Also, a day’s worth of solar charging for only 21 miles range doesn’t strike us as particularly efficient–you’d still be better off using a conventional charging cable hooked up to a solar-generated electricity supply. On the plus side, it could be an amusing answer to the problem of “ICEing”–that of combustion-engined vehicles parking in electric car spots. Why? Well as deterrents go, focusing eight times the solar energy onto the roof of a regular car may not be great for its health, nor its appearance. We’ve already seen the damage focused solar energy can do to cars–neither this Toyota Prius nor this Jaguar XJ luxury sedan got away lightly (pun not intended) after their own run-ins with our nearest star. Our take? It’s a neat system and great to see Ford thinking outside the box. Ford will display its C-Max Solar Energi concept at this year’s Consumer Electronics Show in Las Vegas, beginning January 6. Batteries allow customers with solar panels to store energy during the day and then tap the excess overnight when the sun goes down. The widespread use of electric vehicles could reshape the development of cities, and applying the same battery storage technology to transform the U.S. energy system has “huge potential,” Moniz said. Battery storage advances could threaten the 100-year-old monopoly utility business model that books about $360 billion in annual power sales. An increasing number of customers are reducing their dependence on the grid, turning to solar panels and battery storage as a way to reduce their bills. “Storage is a huge deal,” Moniz said. New techniques including directional drilling and hydraulic fracturing in shale formations helped U.S. oil production grow by a record of more than 1 million barrels a day last year, when the U.S. is estimated to have surpassed Russia and Saudi Arabia as the world’s largest producer of oil and natural gas. The advances have upended world markets as a country that was once far more dependent on imports is now weighing exports. The U.S. met 86 percent of its energy needs in the first 11 months of 2013, the highest since 1986, according to the U.S. Energy Information Administration. Exxon Mobil Corp. researchers involved in studies of the impact of new technology in 2008 identified batteries that could store energy such as those used in electric vehicles as the most disruptive potential energy breakthrough, according to “Private Empire,” a 2012 book by journalist Steve Coll. “If there was one emerging energy technology that seemed to have the practical potential to disrupt the oil industry’s assumptions about the transportation economy, this was it,” Coll wrote. Exxon ultimately concluded battery use in electric vehicles hadn’t advanced to the point of being transformative, he wrote. Homeowners might use battery storage, combined with solar power, to further reduce their dependence on utilities and sell electricity back to the grid, a new business model known as distributed generation. Solar companies from to SolarCity Corp. (SCTY) SunPower Corp. are expanding into backup energy storage. Battery costs are expected to decline as manufacturers, including electric car maker Tesla Motors Inc., ramp up production. In May 2013, Tesla paid the Energy Department $451.8 million remaining on the Advanced Technology Vehicles Manufacturing loan it was awarded in 2009. Electric vehicle costs have declined by a factor of two in the past five years, and they will need to come down by “another factor of two or three” to be affordable for an average consumer, Moniz said. Tesla, based in Palo Alto, California, is seeking to cut the cost of lithium-ion batteries by at least 30 percent, it said last week. Navigant research defines a microgrid as “an integrated energy system network consisting of distributed energy resources (DER) and multiple electrical loads and/or meters operating as a single, autonomous grid either in parallel to or ‘islanded’ from the existing utility power grid.” While remote microgrids number in the thousands, many are still powered by diesel generation. MANILA, Philippines—The temporary restraining order (TRO) on the P4.15 per kilowatt hour increase in the generation charge that Manila Electric Co. (Meralco) wants to collect from its customers has been extended. Four days before the TRO was set to lapse, the Supreme Court yesterday extended it for 60 days or until April 22, tribunal spokesperson Theodore Te said. The high court granted the urgent motion for extension of the TRO and/or preliminary injunction that the Makabayan bloc filed on Feb. 12. The gencos include Masinloc Power Partners Co. Ltd., c/o AES Philippines, San Miguel Energy Corp., South Premiere Power Corp., First Gas Power Corp. and the National Grid Corp. of the Philippines. The TRO also stopped Philippine Electricity Market Corp. (PEMC), operator of the energy spot market, from demanding and collecting the generating charges. The extension came after the Supreme Court wrapped up last week oral arguments on the petitions against the Meralco power rate increase. Following the TRO extension, Meralco head of legal affairs William Pamintuan said the distribution utility, the biggest in the country, would abide by the Supreme Court decision. In a statement, Pamintuan said Meralco “will continue to discuss with the generation companies, PEMC, DOE (Department of Energy), ERC (Energy Regulatory Commission), consumer groups and other stakeholders regarding this issue. Bayan Muna Rep. Neri Colmenares, one of the two petitioners against the Meralco rate increase, welcomed the decision of the high court to extend the TRO. “We just hope that the Supreme Court will also declare unconstitutional [the Electric Power Industry Act of 2001] so that such predatory pricing preying on electricity consumers would not happen again,” Colmenares said in a text message. The Makabayan bloc and the National Association of Electricity Consumers for Reform (Nasecore) went to the high court to question the increases. The increase, when added to the generation charge of P5.6673 per kWh, would have resulted in a power-generation charge of P9.1070 per kWh without the staggered implementation. For a typical household using 200 kWh a month, a one-time increase of P830 would have pushed its monthly bill from P2,212 to P3,041.48. Meralco wanted to collect a P4.15 per kWh rate adjustment from its 5.3 million customers to recover some P9.6 billion in power generation costs last November. The rate increase stemmed from the shutdown of the Malampaya gas pipeline for maintenance from Nov. 11 to Dec. 10. A number of power generation plants also shut down during this time, creating a 45-percent shortfall in the average 6,000 megawatts that Meralco supplies to customers. The shortfall prompted Meralco to buy a more expensive supply from the Wholesale Electricity Spot Market (WESM) and to pass on the cost to its customers. The shutdown of the pipeline also forced plants that use the cheaper natural gas from Malampaya and supply power to Meralco to use more expensive fuel. The ERC approved a staggered rate increase to be collected in December, February and March. But last Dec. 23, the high tribunal issued a temporary restraining order, stopping Meralco from collecting the increase for 60 days or until Feb. 21. In the wake of the TRO extension, Meralco’s participation in the electricity spot market may be reviewed. Meralco still has some P13.5 billion in payables for December and January to PEMC, the WESM operator, but it is constrained from passing on such costs to consumers because of the TRO. Of the total, some P6 billion in deferred payment was for last December and P7.5 billion for January this year. Energy Secretary Carlos Jericho Petilla told reporters that he had authorized PEMC to draw down Meralco’s security deposit or bond of P2 billion, which enables it to participate on the spot market as a buyer of electricity whenever its requirements exceeded its contracted electricity. Petilla said Meralco would be given the chance to ask PEMC to retain its membership on the WESM despite the draw-down to prevent potential service disruptions. He said the quick resolution of the power rate hike issue, whether via the Supreme Court or ERC, would be beneficial to all power stakeholders and prevent market disruptions. PEMC president Melinda Ocampo said the spot market operator had yet to withdraw Meralco’s bond. “We have yet to receive the TRO so we will consider its content on whether we can in fact withdraw the bond,” she said. The Sun.. Our Energy NOW! MANILA, Philippines — Customers of Manila Electric Co. can look forward to a reduction of 13.14 centavos per kilowatt-hour in the generation charge for February to P5.54 per kWh, from the P5.67 per kWh collected in January. This means that households consuming 101 kWh in a month could expect a P13.27 decline in their power bills for February, while those with a 200-kWh consumption will see a P26.28 decrease, according to Lawrence S. Fernandez, assistant vice president and head of utility economics for Meralco. Households consuming 300 kWh and 400 kWh monthly would enjoy reductions of P39.42 and P52.56, respectively, Fernandez said by phone on Monday. According to Meralco, the February generation charge, if to be compared with the actual generation charge of P10.23 per kWh for January, would have represented a P4.69-per-kWh reduction. It can be recalled that the generation charge for the billing month of January was temporarily capped at P5.67 per kWh, instead of the actual P10.23 per kWh, due to the temporary restraining order (TRO) issued by the Supreme Court. The resolution of the case remained pending. In a separate statement issued on Monday, Meralco explained that the reduction this month was due to the normalization of power supply in Luzon, following the maintenance shutdown of the Malampaya facilities, as well as the scheduled and extended shutdowns and forced outages of major baseload power plants in November and December last year. The normalization of power supply was reflected on the cost of power that Meralco purchased from the wholesale electricity spot market (WESM) and independent power producers (IPPs) and through its power supply agreements (PSAs). On a consumer’s power bill, the reduction can be seen on the generation charge component. “This reduction in the generation charge, particularly in the cost of power from WESM, was expected as power supply normalized during the January supply month, with most of the baseload power plants that were previously out of service returning to normal operations and with gas-fired plants no longer using the more costly liquid fuel, such as condensate and bio-diesel,” Meralco explained. “Said shutdown of Malampaya gas facility and the scheduled, unscheduled or forced, and extended shutdown of major power plants during the November and December 2013 supply months caused an aberration in the generation charge levels for the December 2013 and January 2014 bills of customers, which reached record highs of P9.107 and P10.23 per kWh, respectively. Absent such aberration in the market, prices returned to their normal level,” it further said. According to Meralco, WESM charges dropped significantly to only P5.41 per kWh during the January supply month from a high of P36.08 per kWh in December. Average cost of power taken from facilities selling to Meralco under the PSAs fell by 28 centavos per kWh to P4.81 per kWh from P5.09 per kWh. The cost of power purchased from IPPs similarly recorded a 48-centavo per kWh reduction to P5.99 per kWh from the previous month’s level of P6.47 per kWh. For the supply month of January, Meralco got 52 percent of its electricity requirements from its PSAs, 46 percent from the IPPs, 2 percent from WESM. Meralco has repeatedly said that it does not earn from the generation charge, which comprises majority of the electricity bill. Payment for this bill component goes to the power suppliers such as the IPPs, plants selling to Meralco under the PSAs and the WESM. Meralco’s distribution, supply, and metering charges account for only about 18 percent on the average of the total electricity bill.